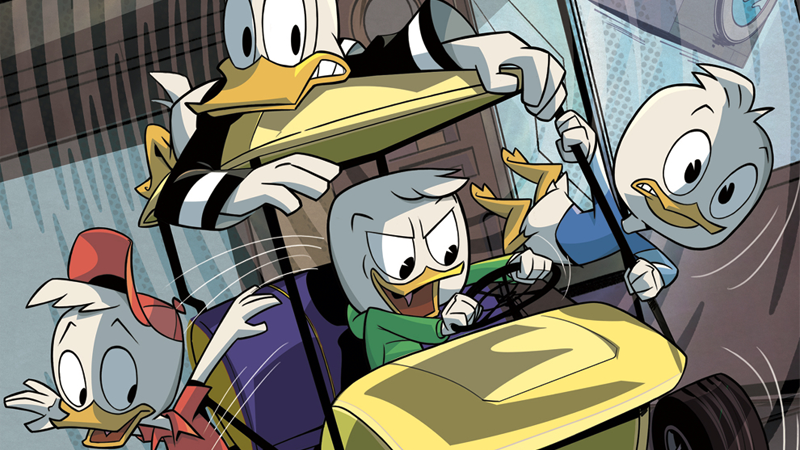 This week saw the launch of IDW and Disney’s brand new DuckTales comic, based on the newly-returned—and utterly fantastic—animated series. It’s a great way to squeeze a little extra Duckburg goodness into your week between episodes. But so far, it’s missing some of the elements that’s made the new show so great. Now, to be fair, the way the comic is set up like an anthology series. The first issue, and presumably every one going forward, has two isolated standalone stories, both written by Joe Caramagna, and with art from Luca Usai, Gianfranco Florio, Giuseppe Fontana, and Dario Calabria. Both of the first issues are set before the events of the new series, in which Donald and his nephews move into McDuck Mansion. This means the first issue is missing two great things that have made the new show a delight to watch. First, the obvious absence: the delightful oddball Webby Vanderquack. In lieu of a Webby appearance in the comic, here’s a gif from last week’s episode, “Daytrip of Doom!” with absolutely no context. 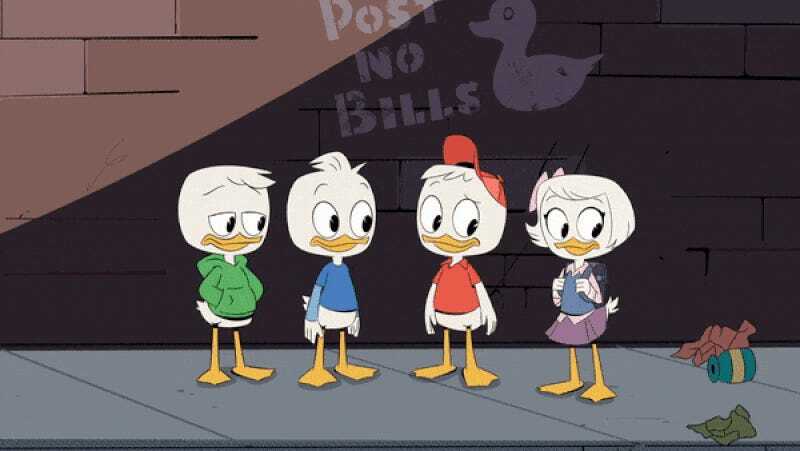 The new DuckTales revamp of Webby in comparison to the classic cartoon might grate on some fans, but it’s given her a more active role in the series that isn’t just pretty hilarious, but it’s one that pushes all the other characters, especially the nephews, into some interesting character growth. The earliest episodes of the TV show, which premiered last weekend, have seen Webby’s sense of adventure and love of mystery push both Dewey and Louie beyond their basic character archetypes—and in the case of Dewey, given him an ongoing story arc as he tries to figure out what happened to his mom. Without her to either stoke the boys’ own thirst for adventures or have the spotlight shine on her, as we saw in last week’s episode, the DuckTales comic feels like it’s missing some of the show’s spark, even as it heavily leans on its aesthetic. The second thing is the serialization that have elevated the new DuckTales beyond an episodic adventure series. Both stories in DuckTales #1 have pretty much the same premise: Donald gets a new job that he must, for contrived reasons, bring his nephews along to while he works. He gets fearful of letting the kids out of his overprotective sight, the kids do anyway, hijinks ensue, and everything goes wrong for a bit, and then everything turns out all right in the end thanks to the boys or Donald figuring something out. It’s totally fine, but it’s basically two stories back-to-back that feel identical, and play on the same handful of character tropes. Donald’s always nervously fearful of his nephews doing anything remotely adventurous. Louie’s always thinking about being rich. Hewey’s the Duckburg equivalent of a Boy Scout. Dewey’s desperate to get out of his Uncle’s watchful eyes and do something exciting. Those are all fine character beats, but they’re the same beats each story in DuckTales #1 relies on, and that’s pretty much it—and without the characters from McDuck Mansion to bounce off them in interesting ways, it’s all the comic really can do. It’s a bit of a missed opportunity, but there’s always the possibility that future issues will be set during the events of the new series, which could tie into Dewey’s search for answers, or at the very least give Webby her comic book due. Look, anything half as good as the new DuckTales cartoon is still pretty great. But there’s also no real reason the comic shouldn’t use all the things the cartoon has that has helped make it so great, either.